Jan 21. Organizational meeting, 4:30PM, LGRT 1634. Jan 28. Paul Hacking, The canonical divisor class. 2:30PM, LGRT 1634. Lecture notes by Anna Kazanova pdf. Feb 4. Jenia Tevelev, Linear systems and examples of surfaces of general type. 2:30PM, LGRT 1634. 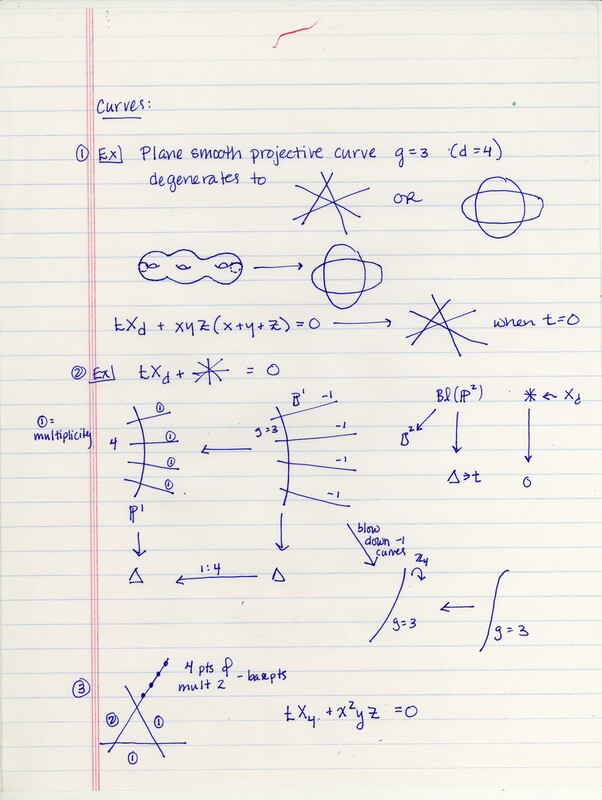 Lecture notes by Julie Rana pdf. Feb 11. David Cox, The Enriques classification of complex algebraic surfaces. 2:30PM, LGRT 1634. Lecture notes by Anna Kazanova pdf. Feb 18. Giancarlo Urzua, Geography of surfaces of general type. 2:30PM, LGRT 1634. Lecture notes by Holley Friedlander pdf. Picture jpeg. Feb 25. DOUBLE HEADER!! Refreshments at 3:45PM. Paul Hacking, Singularities of surfaces occurring as limits of smooth surfaces. 2:30PM, LGRT 1634. 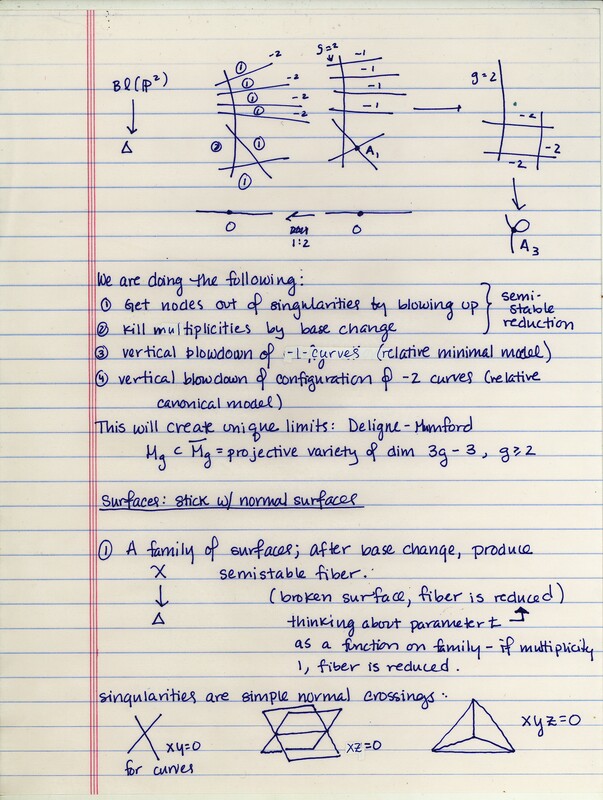 Lecture notes by Alden Gassert pdf. Mar 11. Eyal Markman, Deformation theory 101. 2:30PM, LGRT 1634. Mar 18. No meeting (Spring Break). Mar 25. Alden Gassert, Quintic surfaces. 2:30PM, LGRT 1634. Apr 1. No meeting (AGNES conference). Apr 8. Anna Kazanova, Godeaux surfaces. 2:30PM, LGRT 1234. Apr 15. Julie Rana, The Craighero-Gattazzo surface. 2:30PM, LGRT 1634. Apr 22. Toby Wilson, Enriques-Catanese-Debarre surfaces. 2:30PM, LGRT 1634. Apr 29. Nico Aiello, Barlow surfaces. 2:30PM, LGRT 1234. 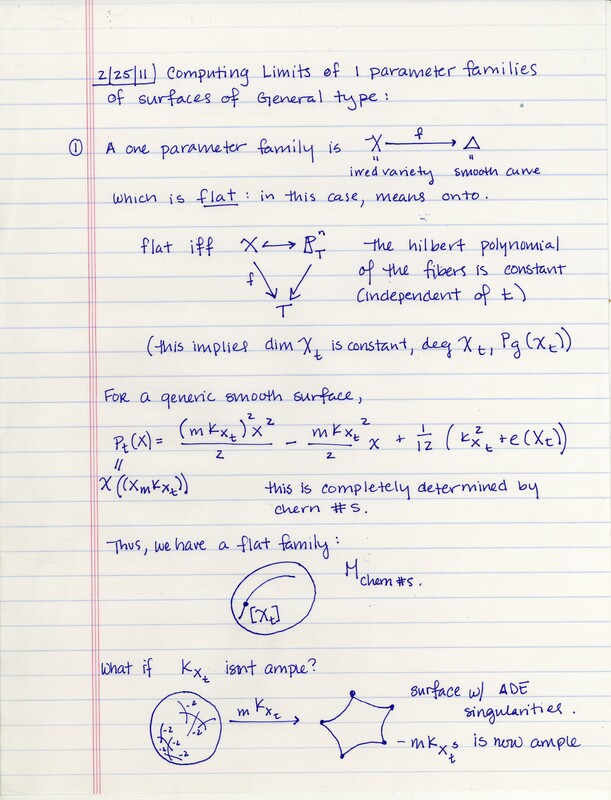 M. Reid, Lectures on algebraic surfaces (videos), here. E. Horikawa, On deformations of quintic surfaces, Invent. Math. 31 (1975), no.1, p.43-85. M. Reid, Surfaces with pg=q=0, K2=1, J. Fac. Sci. Univ. Tokyo Sect. 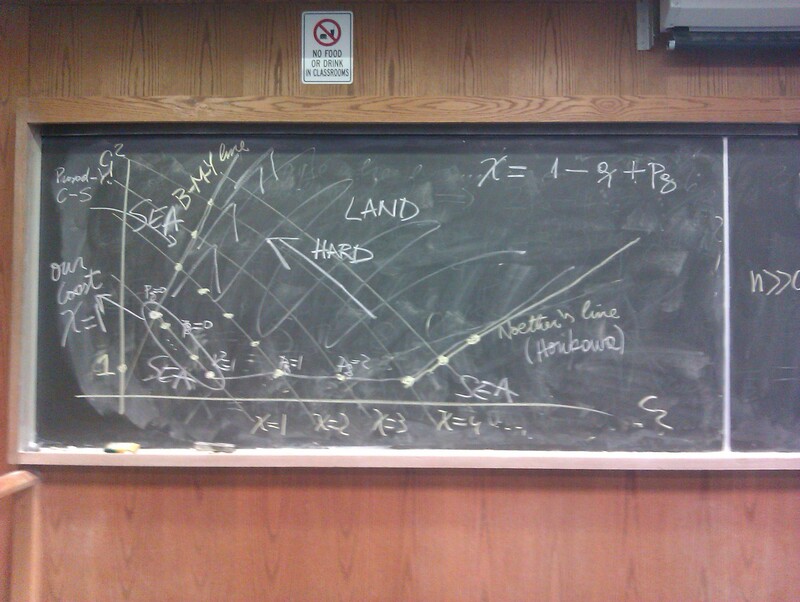 IA Math. 25 (1978), no. 1, 75�92, here. S. Coughlan, Key varieties for surfaces of general type, Warwick Univ. PhD thesis, 12/08, here. P. Craighero, R. Gattazzo, Quintic surfaces of P3 having a nonsingular model with q=pg=0, Rend. Sem. Mat. Univ. Padova 91 (1994), 187�198. R. Barlow, A simply connected surface of general type with pg=0, Invent. Math. 79 (1985), no. 2, 293�301. 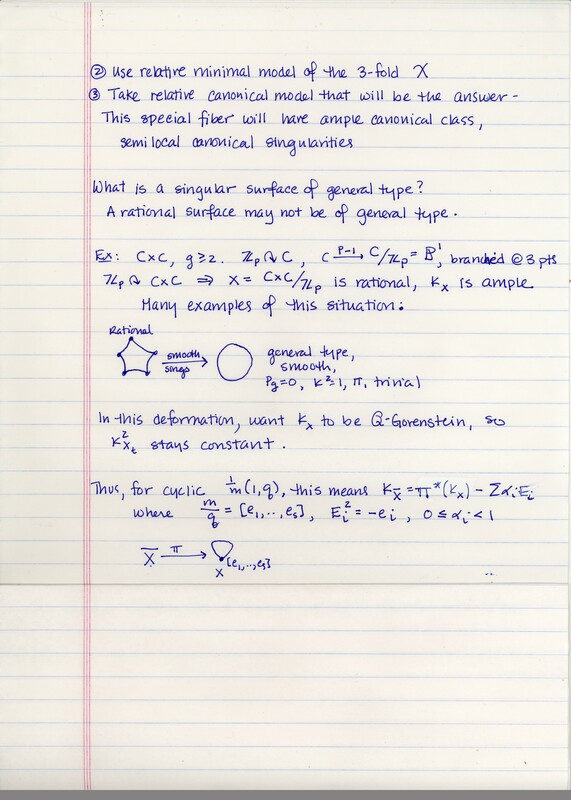 M. Reid, A simply connected surface of general type with pg=0 due to Rebecca Barlow, here. F. Enriques, Le Superficie Algebriche, Bologna, 1949. xv+464 pp. F. Catanese, O. Debarre, Surfaces with K2=2, pg=1, q=0, J. Reine Angew. Math. 395 (1989), 1�55.